This film isn’t as bad as it sounds. I know the title did put me of at first, however I was pleasantly surprised as it was better than I expected. The cast did a good job and the storyline was somewhat original. 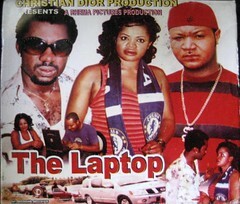 Perhaps calling the film “The Laptop” was a little too literal. As is obvious a laptop plays an integral role in this film. The scenes are mainly between the campus and Nicky’s family home. Nicky meets Chris on campus. He expresses interest in getting to know her better. They start of as friends and then he “toasts” her until she falls for him. They appear to be love’s young dream by all accounts. However her new beau has a more sinister side to him that is soon to be uncovered. Not long after the introduction of Chris into Nicky’s life her brother is the victim of a vicious beating whereby his laptop is stolen by thugs. This occurs because Nicky’s brother Derek is on his way to visit her on campus. En route he stops off to chat up a girl only to have the girl’s so-called boyfriend catch him and beat him to a pulp. Because of this incident Derek does not get to meet his sister’s boyfriend. It is by chance, when his sister excitedly shows him a picture of her boyfriend that he finds out that this guy that his sister is seeing is in fact the perpetratorand prominent cultist. Driven by desperation Derek approaches a rival cult member to help him get his laptop back. A war ensues and at one point Derek shoots his girlfriend’s mother. He does not know that Nicky and Chris are related and thinks that it is solely Derek’s mother that he is shooting. He does eventually find out that Derek and Nicky are brother and sister and appears to be truly remorseful for his actions, taking the step to return the laptop to Derek without consent from the cult members. NON-SENSE!!! Who gives a damn about love when this miscreant just shot your mother??? Plus he beat her brother to a pulp over ANOTHER GIRL! Let me say it one more time… NON-SENSE!!! The film ends with Chris being shot by a member of his own cult. Nicky is there hollering, screaming and crying like a gatdamn fool. Was Muna doing this eye rolling thing that made him look positively devilish? When they had this scene when Muna was thinking with the voiceover expressing his thoughts was the voice not Muna’s? that was WE-IRD!!! Well I can say I enjoyed watching this movie. What more can you expect from a guy like Yul obviously its good stuff. I hope you will find time to read my comments. Thank you. I have read your comment! thanks for contributing! plz how is mcmorris ndubueze, i have not seen him acting again i hope all is well. plz i hard smthing abt him but i,m not so so sure i pray wht i head should not be true becos he is a big big fishe and i wondt wt anything to happine to him, plz is mcmorris ndubueze dead. when and how. No he is not dead. Go and look for him on Facebook and you see him there! plz where is macmorris ndubeze, heard he is dead. Is it true if false where is he?